The Tanyard is one of Pensacola’s oldest neighborhoods, sitting just west of downtown. Centered around Pensacola’s working waterfront, the neighborhood was once a diverse community with a burgeoning industry, creole cottages and shotgun homes. Washerwoman Creek, a freshwater spring named by the British who occupied the area in the mid-late 1780s and reflective of the tanneries dotting the area at the time, was eventually filled and covered by development with government buildings. Today, during heavy rain events, the water that once drained to the creek floods into the predominantly African American neighborhood. Outdated infrastructure means that raw sewage is often seen running down the streets, creating a health hazard for residents. Elevated levels of Enterococcus Bacteria have been found at a local beach. In 2004 Hurricane Ivan struck Pensacola particularly hard, initiating a federally declared disaster; flood survivors in The Tanyard express fears over the next big storm. 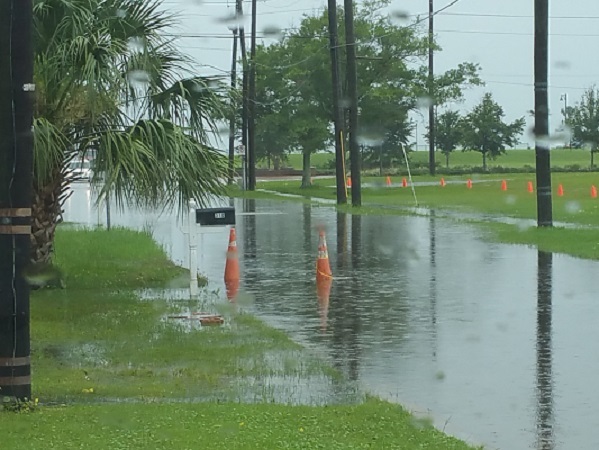 High tide events, combined with heavy rainfall and storm surge overwhelm storm drains, flooding homes and businesses. Stormwater often takes weeks to drain from the streets. Pensacola and Escambia County have a long history of environmental contamination. The EPA currently lists 5 Superfund sites within the city limits of Pensacola including an old wood treatment facility, landfill, and an active naval station. During their operations, these sites generated wastes that contaminated soil, sediments, ground and surface waters. In June of 2016 contaminated groundwater containing lindane-an agricultural insecticide also used as a pharmaceutical treatment for lice and scabies-was found at Corinne Jones Park in The Tanyard. The Tanyard Association was formed in 2005 to address concerns related to the rapid gentrification of the neighborhood, industrial development, ongoing contamination, and flooding. The group’s Facebook page has over 70 followers. In the face of rapid gentrification, the group is rallying to address the chronic flooding in a way that preserves their cultural heritage and identity. The Tanyard Association would like to obtain a better understanding of the causes of flooding in their neighborhood. The group would like to work with a dedicated hydrologist to investigate local hydrodynamics, synthesize available reports and develop next steps or proposed solutions. The Tanyard Association will use their enhanced understanding to have productive interactions with local decision-makers. This project has been conceived and designed in partnership with community leaders at The Tanyard Association and Flood Forum USA. Gloria G. Horning, Ph.D. is a social and environmental justice advocate based in Pensacola, Florida. She has nearly thirty-years experience in working with disenfranchised communities that continue to be plague by unregulated landfills in the historic African-American communities–Wedgewood, Rolling Hills and Olive Heights. Currently Dr. Horning is fighting for flood relief in the oldest neighborhood in Pensacola — The Tanyard. Dr. Horning holds a Ph.D. from Florida State University. Her dissertation focused on environmental issues facing small communities’ and the health impacts on the citizens. Dr. Horning is the Vice President of the Tanyard Association and will serve as the community lead. Dr. Horning will be supported by Marilynn Lowe, President of the Tanyard Association. Jaap Nienhuis is an assistant professor at Florida State University, where he leads the Coastal Morphodynamics group. His work primarily involves developing and applying hydrodynamic and morphodynamic models of coastal environments to better understand and predict coastal change and coastal hazards such as flooding and erosion. Jaap Nienhuis obtained BS and MS degrees in coastal engineering in the Netherlands, and a PhD from MIT-WHOI specializing in coastal sediment transport. Prior to joining FSU, Jaap Nienhuis worked in New Orleans studying subsidence and wetland restoration of the Louisiana coastal environment. This project is part of one of Thriving Earth Exchange’s cohorts. Thriving Earth Exchange has partnered with Flood Forum USA which supports grassroots flood groups across the country by helping them develop strategies for a sustainable future. Thriving Earth Exchange is working with 15 of their grassroots groups to connect them with scientists who can help them better characterize neighborhood-level flood risks and work effectively with local decision makers to mitigate those risks.